A comprehensive reference resource spanning Charles I's first parliament of 1625 to the Restoration. Excellent soldier/statesmen biographies and campaign maps. A vast collection of searchable databases, invaluable for access to state papers, court registers and other legal documents. The Open University's free OpenLearn site has dozens of useful resources, including free courses and audio and video clips. 11 major sources from the Early Modern period to the 19th century. Includes the 17th and 18th century Burney Newspaper Collection, the House of Commons Parliamentary Papers and the Proceedings of the Old Bailey Online. More collections to be added in 2012. The usual Wikipedia-advice-caveats apply, but click away and let it guide you. Who knows where you'll end up? 240,00 manuscript pages from eight London archive and 15 other datasets. Access to historical records containing over 3.35 million name instances. The best central source for finding individual soldiers, at the National Archives, Kew. An incomplete list of known sources, but a great starting point. More than 125,000 titles listed in Pollard & Redgrave's Short-Title Catalogue (1475-1640), Wing's Short-Title Catalogue (1641-1700) and their revised editions, and the Early English Books Tract Supplement. Also contains the Thomason Tracts (1640-1661) collection, consisting of over 22,000 printed items, bound in 2,000 volumes, including 7,200 news pamphlets and newsbooks, providing detailed accounts of battles, negotiations, and political machinations. Witness testimonies mainly by Protestants, but also by some Catholics, from all social backgrounds, concerning their experiences of the 1641 Irish rebellion. 30 battle reports (so far) from the wider conflict across Britain, including key facts, terrain maps and aerial photos. Website from Tyger's Head Books providing daily news from the developing English Civil War, beginning from the Battle at Edgehill in October 1642. How to make and source 'things mid-17th century'. How to kit yourself out for the English Civil War. Early 17th century military drill illustrated and animated. Also includes detailed pages on siege warfare. Detailed interactive map of the battle, including images, primary sources and suggestions for further reading. Project using digital methods to reassemble and interpret the correspondence networks of the early modern period. Fantastic resource that allows you to search a wide body of digital resources relating to early modern and eighteenth-century London, and to map the results on to a fully GIS compliant version of John Rocque's 1746 map. A list of useful links to collections, companies and guilds, journals, societies, research centres and re-enactments groups. Records of the Court of Chivalry from 1634 and 1640. 738 surviving cases covering a wide variety of topics relating to the social, political and cultural history of the period, from ship money and the Bishops' Wars to pew disputes and duelling, from heralds visitations and grants of arms to brawls in the street and quarrels at race meetings. Jeff and Caroline's site of "useful 17th century stuff". Lots of info on costume, including period knitting and sewing techniques, as well as articles about life in the Sealed Knot. A blog about early modern books, history and culture. Articles by historical fiction authors concentrating mainly on the 17th century. A selection of English and Scottish images mainly from the 1640s, intended primarily as a costume guide. A précis of the years 1603-1714. Teaching resources for schools, including online quizzes, wordsearches etc. More biogs and descriptions of battles/radical groups etc. 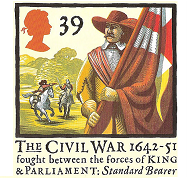 Useful collection of links to writers of the English Civil War. Open Education Resources used in teaching at the University of Oxford's Continuing Education department. Mainly podcasts and links but worth checking as more resources are likely to be added. Ed Podesta's site helps history teachers think about and plan their history teaching. This link is no longer viable. Just thought you would like to know. I also wanted to say that your website is fantastic and I appreciate all of your hard work! Thanks Deborah - the content seems to have been subsumed into the OpenLearn content (see the other link above) so I've taken it down. Thanks for the spot - and for your kind words about that site! Thanks Emma for your kind comments - all the best with your coursework.